The Assia brothers founded eToro in 2006. It is a registered social trading platform and operates offices out of Israel, the United Kingdom and Cyprus. They are not strictly binary brokers but help to simplify investing and provide an easier route into this world for a greater number of people. The company is very quick to adapt to each trader’s needs, and have recently added the capability to trade in Bitcoin and other cryptocurrencies. This ability to be flexible is one of their main attributes and is partly why the company has continued to grow so well. eToro currently has 4.5 million traders, which means that they can offer a huge range of information through this impressive network. It also means the social interaction is at a high level. The trading window itself was designed to be simple and user-friendly. A demo account is opened instantly for traders, so they can have a quick look around and get used to the format before doing any real trades. All information is contained within the trading window, with clear buy and sell buttons displayed along with the movement in the price for that day. eToro does take a small fee in exchange for positions that are held overnight or the weekend, but this is standard practice in the business. The bigger the trade, the higher the fee. There is a minimum deposit of $200 with minimum trades of $25 and a maximum of $100,000, which provides traders with a decently wide range of options. It should be noted that these deposit requirements may vary slightly for those not residing within the UK. For all transactions there are a number of documents required including a passport, recent bill and copy of credit card if that is the payment method. There are charges on all withdrawals, the amount of which depends on the amount withdrawn. For the most part eToro does not see many complaints being made, but rather just individual traders disappointed in the way they performed which is not the fault of eToro. Withdrawal delays can occur but there is a verification process, which ensures that no hold ups occur again. For those customers who do have a query, there are a number of ways to get in contact with eToro. There is a comprehensive FAQ to be found on their website and if that doesn’t help then clients can message through Facebook, direct email or even a contact form. Responses take between one to two working days. 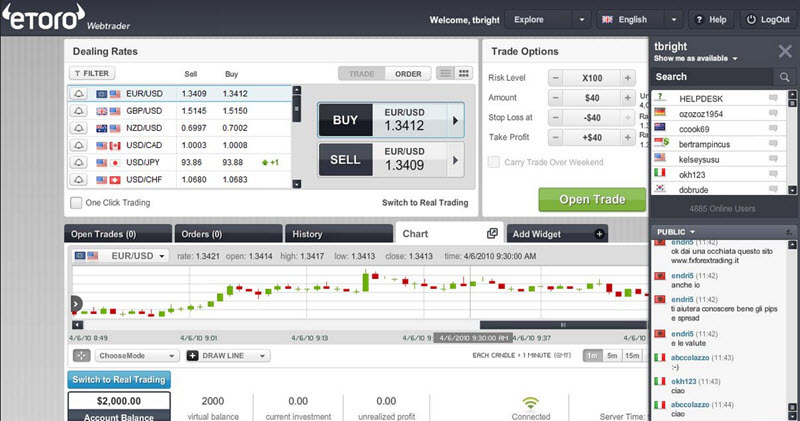 Overall eToro offers a comprehensive and easy to use service. In addition to its online platform, it can be accessed via a mobile app allowing traders to continue their transactions whilst on the move. The app emulates the trading look of the site and enables the user to make all the same actions as they would on the desktop version. With its high levels of flexibility and excellent customer service response, eToro is one of the better options for anyone venturing into the trading world.